Wrapped in white sheets to memorialize the uninsured dead, a crowd of 150 gathered to wave protest signs demanding universal health care. Their “die-in,” staged in August 2009, attracted considerable media attention. 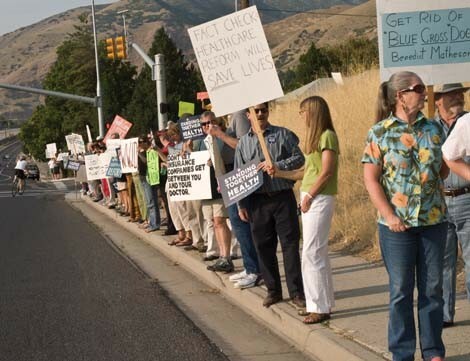 The protesters waited at the entrance of Millcreek Canyon hoping to seize a moment of time from their elusive 2nd District congressman, Rep. Jim Matheson, a Blue Dog Democrat who voted against health-care reform in committee and would also vote against it in the U.S. House of Representatives. The protesters had heard the congressman was on his way to Log Haven Restaurant for a fundraiser, and they thought they had a choke point. “We thought there was only one way in there,” activist Richard Lafon says. 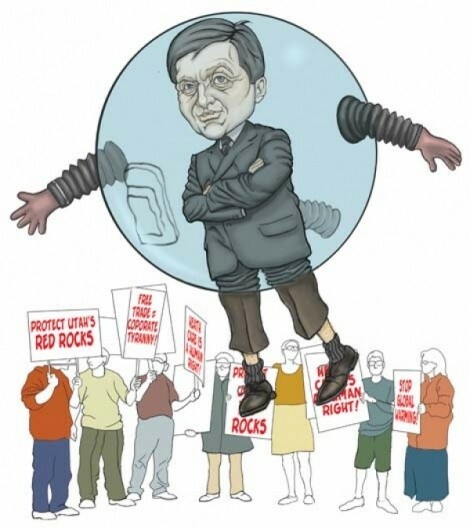 While he has challengers to the political left and right in his 2010 race for reelection, Matheson is favored to win, perhaps proving that he can slip by progressives in the political sphere as easily as he did protesters in Millcreek Canyon. After all, his approval ratings are as high as ever, and each time he’s reelected, it’s by a wider margin. Matheson supporters argue that that proves he’s doing his job: Utah’s 2nd District is conservative, and therefore Matheson needs be moderate, both to win re-election and represent his constituents. His moderate politics have turned Republican-leaning independents into Democrat-leaning independents and widened the Democratic Party’s appeal in Utah. Despite frustration among progressives, many argue it’s bad strategy to purify the Democratic Party of moderates like Matheson. In Congress, shrinking or eliminating the party’s majority would hamper or end its ability to direct the agenda. And on the local and state level, supporters credit his moderation with boosting the party’s victory tally. Despite all that, an “anyone but Matheson” sentiment is brewing. Some progressives argue that if their chosen candidate can’t win the seat, perhaps even a Republican would be better. It started in 2000. That year, Matheson—the son of the late and well-liked Democratic Gov. Scott M. Matheson—won the seat that had been held by Republican Merrill Cook. A divisive politician among Republicans, Cook had been trailing in the polls during the year leading up the election and was defeated in the Republican primary. Salt Lake County progressives really met their fate the next year, however, when the Republican-dominated Legislature tried to solve the irksome 15 percent Matheson victory by changing the boundaries of the 2nd District. What had been a Salt Lake County-only district was changed to include many rural, conservative counties on the eastern side of the state. The district now stretches from the Avenues of Salt Lake City to San Juan County. Even the conservative editorial board at The Wall Street Journal called it gerrymandering. According to Cook, who toyed with the idea of again seeking the congressional seat he once held but instead is running for the U.S. Senate, Salt Lake County remains “the heart” of the 2nd District. The redistricting, however, lessened the importance of urban voters, where Utah progressives are concentrated. Zoom forward to 2006, after Matheson had barely won re-election both times in the new district. That year, some progressives, on the advice of then-Salt Lake City Mayor Rocky Anderson, vowed to vote for a Green Party candidate to send a message to Matheson that it was time to move left. It was reported in Congressional Quarterly that year that Matheson had voted in favor of President Bush’s agenda 63 percent of the time, including a vote in favor of invading Iraq. Next, zoom forward to 2009, when Democrats controlled Congress and the presidency. His same-old critics were further frustrated, but a whole new crop of Democrats started to get angry, too. Local activists organized a phone tree in May to challenge Matheson when he strayed from progressive ideals on the Waxman-Markey cap-and-trade climate-change bill. There are ample reasons for wanting to be a party delegate: you get outsized influence in choosing candidates for public office, candidates finally seek your attention rather than you having to gain theirs and you get to know your neighbors—so long as they are members of your party. “The precinct is the very bottom, grass-roots starting point for all politics,” says State Democratic Party Stonewall Caucus chair Nikki Boyer. City Weekly asked Boyer for some tips on how to become a delegate for either the Democratic or Republican parties, and what to do if you are elected. Step 1: Call your county clerk for the location of your March 23 mass meeting. Step 2: Recruit a few—or several—close neighbors to come with you and, ideally, vote for you. Step 3: Go to your neighborhood mass meeting. Bring identification that proves you live in the neighborhood. Step 4: Go to convention in early summer, let the candidates address you, and then vote in all of the races for your district. Step 5: If there are more than two candidates in any race, and no candidate in the first round gets 60 percent of the vote, delegates vote again for either of the top two candidates. That’s it. The winner gets his or her name on the ballot as the official candidate from the party. “Your time commitment as a delegate is minimal,” Boyer says. “It’s just one day per year [for convention].” For more information about the caucus meetings, contact your county clerk or go to UTDemocrats.org or UTGOP.org. The phone tree was activated just once, but his office received 400 calls that demanded a change in his position. “In response to that, [Matheson] went underground. He didn’t show up to the rest of the hearings, he skipped committee markup and never showed up during the floor debate,” says activist Tim DeChristopher, the so-called Bidder 70, so nicknamed for his role in fouling up a public lands mineral-lease auction in the waning days of the George W. Bush presidency. That was in May. The “no-show” Millcreek Canyon showdown happened in August, when some activists were already talking about recruiting a candidate to oppose Matheson, says “die-in” organizer Stephanie Bailey- Hatfield. Not everyone thought it was a joke. Potentially viable candidates responded to the ad, including two University of Utah professors. About that time, a loose collection of about 10 progressive activists began organizing what would become the Citizens’ Candidate organization.